One might say that William Moorcroft couldn't help but be a potter. He was born in Burslem, members of the Moorcroft family were employed in 'the Potteries', he was schooled in Longport and went to Burslem School of Art. Although he was groomed to be a teacher, it was little surprise that his first job in 1897 was literally on the doorstep as a designer for James Macintyre & Co. Although a vibrant and successful business, they were struggling to break into the Art Pottery market that was colonised by many of its competitors such as Doulton, Wedgwood and Minton to name a few. 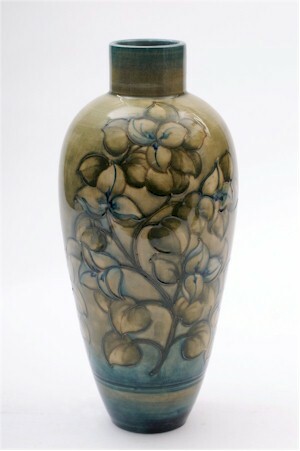 A James Macintyre Florian Ware vase in the Daisy pattern, circa 1905. The first tentative signs of Moorcroft's aptitude came quickly with the acceptance of his bright red, blue and sumptuously gilded Aurelian Ware. William Moorcroft soon realised the decorative potential of tubelining – a slip-trailing technique only previously used on tiles. Indeed, a number of Aurelian Ware were already being experimentally enhanced with tubelining. At some point in 1898, Macintyre promoted Moorcroft and gave him a free hand to pursue his ambitions. Not only did Moorcroft prove to be a talented designer, but he also had skills in chemical and industrial processes that proved invaluable when shepherding his projects through the factory. 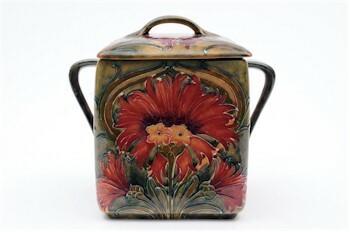 In 1898, the first recognisable Moorcroft pieces were launched in the guise of Florian Ware. As the name suggests, from the outset the primary influence came from organic forms and particularly from flowers and foliage. The often sinuous shapes also fitted neatly within the Art Nouveau fashion, although one can also see hints of ancient ceramic forms that Moorcroft was familiar with when studying at the British Museum as a student. It was also now that William Moorcroft's initials or signature appeared on the base of his work. By the early and mid 1900s, other florally-inspired designs, including Cornflowers and Poppies, appeared and were joined by early landscape designs, such as Hazledene and another which included a rather abstract Celtic roundel which became known as Flamminiam. This latter design was produced for Liberty of London, who took an active interest in his work. Indeed, it was this relationship that led to Moorcroft going it alone and setting up his own rival concern in Cobridge in 1913. 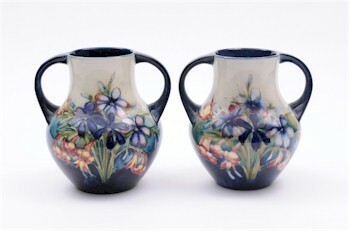 A pair of Moorcroft Spring Flowers pattern vases, circa 1940. Whilst the bulk of his designs were still influenced by flowers and foliage, they became less intricately busy and less sinuous. Once he had made the break, Moorcroft was free to experiment with high-fired glazes and, by 1920, had produced his first flambé pieces. It wasn't just Liberty that took and interest. Queen Mary was an avid collector and, in 1929, Moorcroft was awarded a Royal Warrant as Potter to HM The Queen. On Moorcroft's death in 1945, the business and the royal warrant were transferred to his son Walter Moorcroft. It was very much business as usual and very little change occurred, although Walter's designs were, perhaps, a little more exotic with the introduction of patterns such as African Lily, Magnolia and Bourgainvillaea. 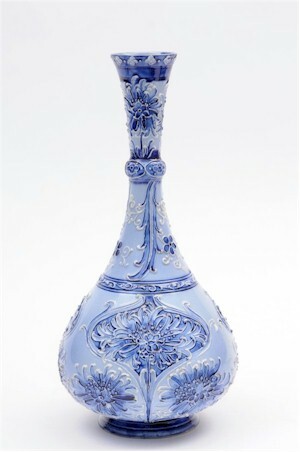 The Moorcroft Company bought out Liberty's interest in 1962 and, arguably, the company struggled to flourish. Walter Moorcroft's younger brother John Moorcroft took on the reins in 1984 and there were several changes of shareholding before stability was resumed in 1993. There are very few home grown ceramic concerns left, so it is good to see that Moorcroft is still going strong.